It's common enough to find citrus fruits in salads. 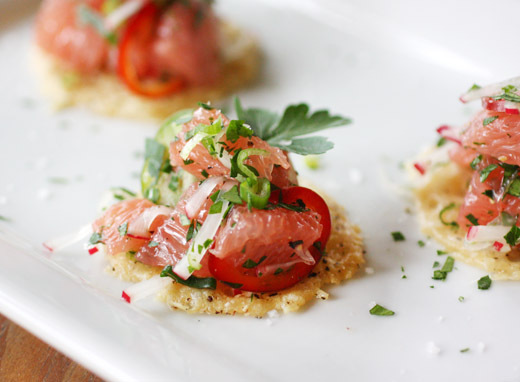 Grapefruit and avocado or orange and fennel are two classic examples. I wanted to make something similar but brighter and spicier and more of a winter version of a summer dish. 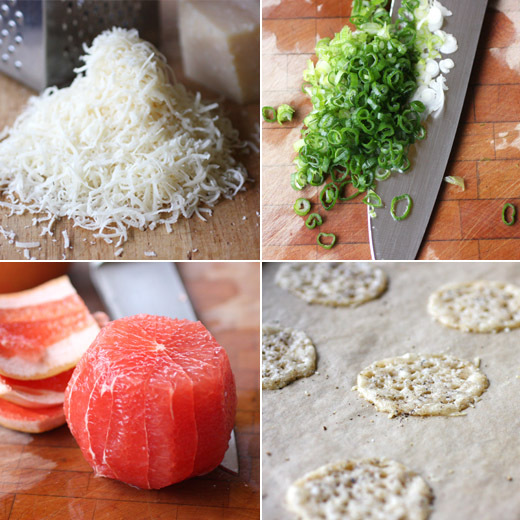 I had a page from last September's Food and Wine in my idea stack, and I kept coming back to the parmesan tuiles with heirloom tomato salad. A small, crisp, savory cookie was a good vehicle for a bite or two of salad, and I started re-imaging the salad on top with winter's citrus. I had just received a box of Texas red grapefruit from TexaSweet, so I was ready to experiment. Some kind of chiles definitely needed to be included as well as something herby. I also wanted some sort of vegetable to balance the grapefruit's sweetness. I tried a mix of chopped grapefruit segments, tiny slivers of habanero, sliced green onion, and broccoli sprouts, and it was good but not perfect. The habanero was just way too hot in a big bite of salad, and the sprouts didn't add texture. I tried again with thinly sliced jalapeno and fresno chiles, some fine julienned pieces of radish, and parsley. That iteration combined all the flavors and textures I had in mind. I actually made the parmesan bases two different ways. First, I followed the recipe from the magazine for the parmesan tuiles which is a mixture of grated parmigiano-reggiano, softened butter, a little flour, and some black pepper. That dough was formed into a log and cut into round cookies that baked into lacy, crisp wafers. The second version I made were just parmesan frico. I piled stacks of grated parmigiano-reggiano on a parchment-lined baking sheet and baked until the cheese melted into rounds. When cooled, the two cookies were almost the same with the latter being a little quicker and easier to make. For the salad, I cut the peel and pith off of two ruby red grapefruits, and then cut segments which I chopped into chunks. A jalapeno and a fresno chile were each thinly sliced, and two radishes were julienned. Two green onions were thinly sliced, and some parsley was finely chopped while a few leaves were left whole for garnish. All of the salad items except for the whole parsley leaves were combined in a bowl, seasoned with salt and black pepper, and then scooped with a fork to strain off the liquid when placed on each parmesan tuile. The sweet, fresh, slightly bitter taste of the grapefruit was the center of attention, but the chiles did not go unnoticed. The radish, parsley, and green onion all added good balance. The big, bright flavors, as well as serving it on a parmesan cookie, made it a fun salad for winter. Of course, summer tomatoes would be good here too, but citrus worked extremely well for a February salad. Show me a cookie or type of candy with a crunchy, salty ingredient, like pretzels for instance, and I'm sold. 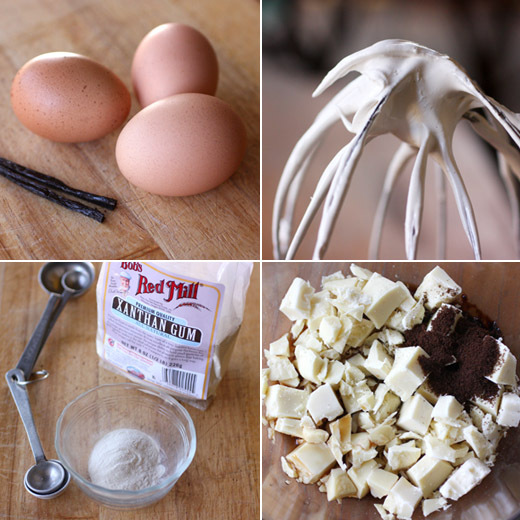 When sweet and salty are together in a recipe, I almost always have to try it. 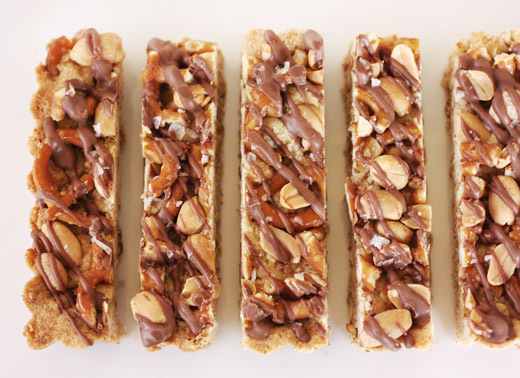 These shortbread bars make use of the pretzels in two ways. Rather than just topping the cookie bars with broken pieces of pretzels, ground pretzel crumbs also make up part of the dry ingredients in the dough. I found this recipe in last October's issue of Living magazine, and then I had to take it a step or two further. After making the cookie dough and pressing the broken pretzel pieces into it, I thought some dry roasted, salted peanuts would be at home there as well. Then, after baking, I felt the need to gild the bars with a drizzle of melted chocolate. The salty-sweet flavor thing is a success here, but there's a bonus with the pretzel flavor that was worked into the shortbread with the crumbs. Whether you keep these simple or start adding the extras like I did, these are very worth trying. The bars were baked in a rectangular tart pan with a removable bottom, and that shape was very easy to cut straight across into pieces. First, some pretzels were pulsed in a food processor until powdery. 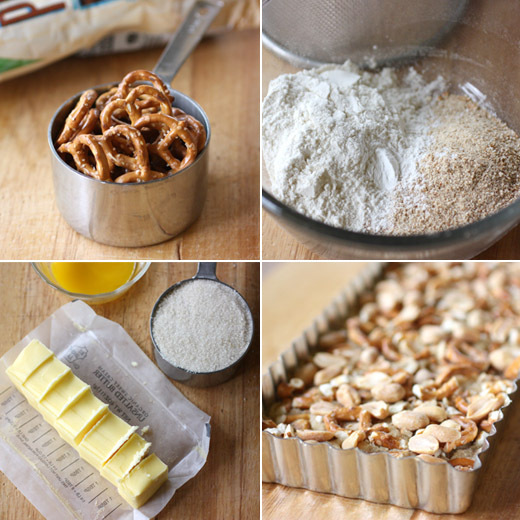 One half cup of the pretzel powder was added to flour and baking powder for the dry ingredient mix. Then, more pretzels were coarsely chopped in the food processor. Butter and sugar were combined in a mixer, and then an egg yolk was added followed by the dry ingredients and then some of the coarsely chopped pretzels. The dough was pressed into the tart pan and topped with the remaining chopped pretzels which were pressed into the surface. At this point, I added a handful or two of dry roasted peanuts and pressed them into the dough as well. The shortbread baked for about 30 minutes and was left to cool. I melted some bittersweet chocolate and drizzled it over the cooled cookie tart. Caramel, peanut butter, and cookies all work for me in this arena of mixing salty and sweet. And, I'm sure I'll repeat this topic sooner or later because there's a tart with a pretzel crust I've been meaning to try for years. I might have to start a sub-section in my recipe file just for sweets with pretzels. Any time I leave Austin, even for just a few days, I miss the salsa. You can find tacos just about anywhere, and some are certainly better than others, but it’s the salsa I always look to first to judge a place. If I’m served a bland salsa that tastes more like a jar than like fresh, hot chiles, I know the meal isn’t going to matter much. Here at home, I sometimes choose a restaurant based on which type of salsa sounds good that day. I might be in the mood for a bright, tomato-forward sauce. Other days, a smoky puree of dried chiles could be what I want. There are tangy tomatillo salsas, extra-hot chipotle ones, chunky salsas, thin and smooth versions, and on and on. And, I’m not above begging for recipes for salsas. On one occasion, I asked a server at a restaurant if I could have the recipe for the deep, dark, smoky, and very spicy salsa they offered. After checking with the chef, she told me, no, she wasn’t allowed to give it to me, but then she quietly explained to me what she observed each day as the salsa was made. Serrano chiles were roasted until well-charred, and then they were pureed with onion and a little garlic. That’s still one of my favorites, but I always enjoy trying new ones. So, I was thrilled to see an entire article about various salsas in the August/September issue of Saveur, and I recently made two of them. The tomatillo and chipotle salsa with roasted garlic was simple and delicious and perfect for dipping chips. The one I want to tell you about today, though, is the peanut and chile de arbol salsa because it’s a little different from all the others I usually encounter. 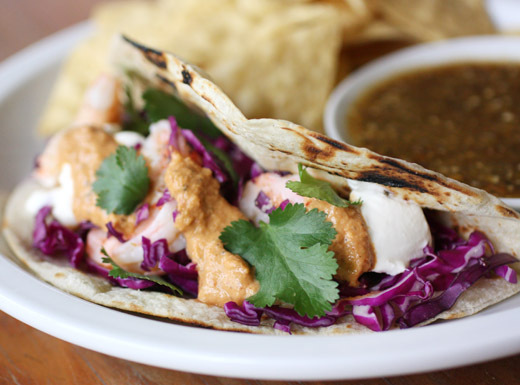 This is a thick puree, a little like a satay sauce, and it’s very well-suited to top a shrimp taco. For this salsa, everything is cooked in a skillet on top of the stove. 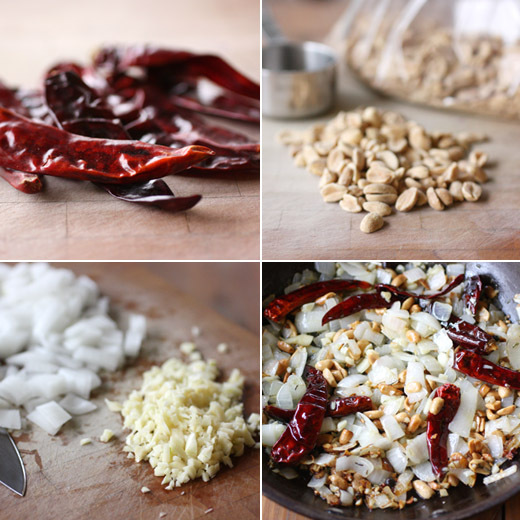 Peanuts, thyme, dried arbol chiles, black peppercorns, allspice berries, minced garlic, and chopped onion are sauteed until the onions are softened. The entire mixture is transferred to a blender, a little apple cider vinegar, salt, and some water are added, and it’s pureed until very smooth. Mine seemed very thick, so I added a bit more water and another dribble of vinegar and pureed again. The finished sauce is a nice, light, beige color which might fool you about the level of heat you’re about to experience. The arbol chiles are not a subtle variety. 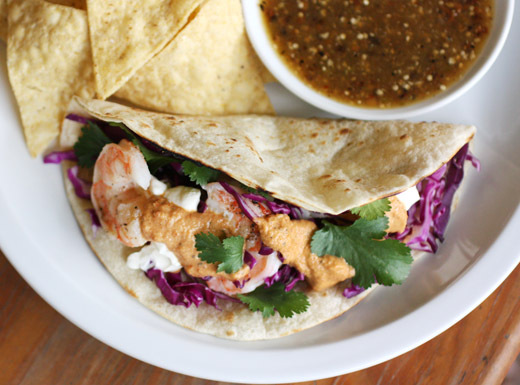 However, once the salsa is spooned into a toasted tortilla filled with shrimp, shredded cabbage, and cilantro, its spiciness is just right. This is a keeper for my ever-expanding list of salsa favorites. I can’t believe Canal House Cooking is already on Volume No. 7, and I can’t believe I don’t have them all. I definitely need to fill those holes in my collection. This latest volume was inspired by Hirsheimer and Hamilton’s month-long visit to Tuscany, and I received a review copy. They spent a month in a stone farmhouse at the end of a gravel road and cooked with all the ingredients of fall they found nearby. When they returned to their studio, they developed the dishes found in this volume based on simple, Italian, autumn cooking. There are tramezzini and panini with truffle butter and buttered toasts with bottarga, hearty soups with chicken and escarole or little stuffed pasta, and there is pasta. With recipes for fresh spinach pasta and ricotta, you can make lasagne, ravioli, and tagliatelle dishes entirely from scratch. There are dishes for seafood, poultry, and meat. In the vegetables section, the peppers in agrodolce are stuffed with anchovies and covered with a reduced sauce made from currants and vinegar, and the photo alone convinced me I need to try it. For dolci, there’s an apple cake, a beautiful jam tart, and gelato di gianduia among others. I’ll be turning back to the pasta pages soon enough, but first, I tried the risotto bianco. 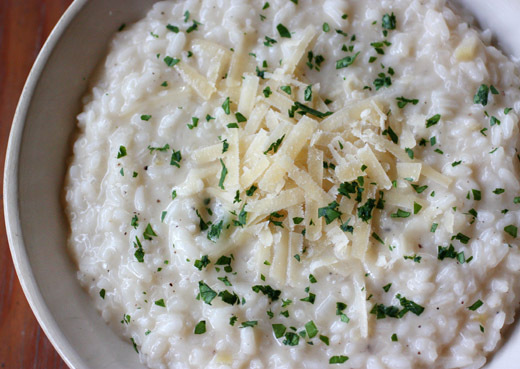 It’s as simple as risotto gets since it’s built with water rather than broth and only involves a few other ingredients. The ingredient that caught my attention, though, was preserved lemon rind. I have some lemons that I preserved a few months ago, and I was delighted to use them here. You might wonder if this risotto is going to be bland since you start by simply bringing plain water to a simmer. Fear not. The beauty of the dish is the simplicity. As the water comes to a simmer in a saucepan, butter is melted in a large saute pan, and finely chopped onion is cooked just until translucent. The chopped preserved lemon rind is added next followed by the rice. After toasting the rice just a bit in the butter, you proceed as usual with risotto-making. A little water at a time is added as you stir and stir. 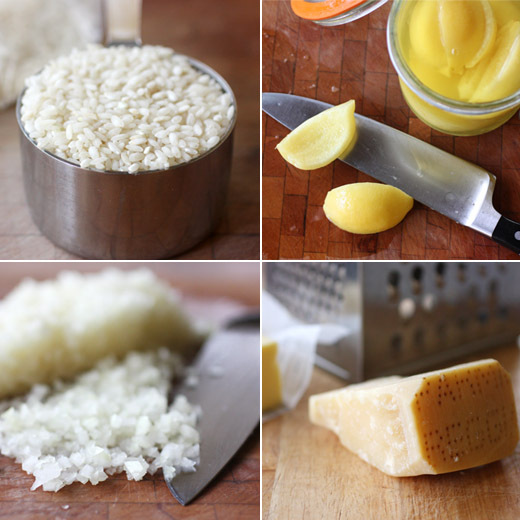 When the rice is tender with a firm center, a little more butter and some grated parmiggiano-reggiano are added. The lemon flavor is actually very subtle in the finished dish, but then everything about this is meant to be subtle. Fight the urge to make it more complicated. Don’t use broth in place of the water, and don’t caramelize the onion. You’ll get a risotto with fresh flavors of onion and lemon, richness from the butter and parmiggiano, and a new appreciation for simplicity on the plate. 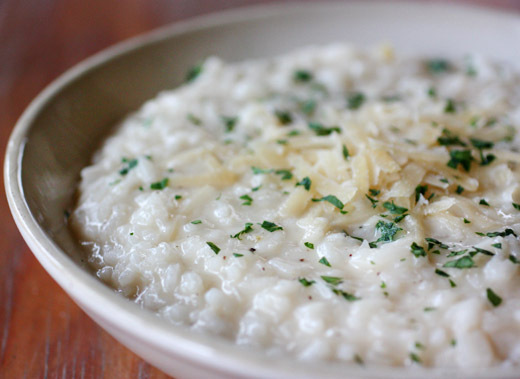 Risotto is traditionally made with the short-grain rice of the Po Valley. There are three main rice varieties: arborio, with its large plump grains that produce a starchy risotto; carnaroli, smaller grains that produce a looser (wavy) risotto; and vialone nano, with firm grains that cook up soft with a kernel of chewiness in the center, just the way Italians like it. Fill a medium pot with about 5 cups water and bring to a gentle simmer over medium heat. Reduce heat to low and keep the water hot. Melt 3 tablespoons of the butter in a heavy deep sauté pan over medium-high heat. Add the onions and cook, stirring with a wooden spoon, until soft and translucent, about 3 minutes. Stir the preserved lemon rind, if using, into the onions then add the rice, stirring until everything is coated with butter. Add 1/2 cup of the simmering water, stirring constantly, to keep the rice from sticking to the bottom of the pan. Push any rice that crawls up the sides back down into the liquid. When the rice has absorbed all the water, add another ½ cup of water. Continue this process until you have added most of the water, about 20 minutes. Taste the rice, it is done when it is tender with a firm center. The fully cooked risotto should be moist but not soupy. Add the parmigiano and the remaining 1 tablespoon of butter and stir until it has melted into the rice. Taste, and season with salt and pepper, if needed. Since I made the decision to avoid using gelatin, I had wanted to make homemade marshmallows with a vegetarian alternative. Then, I received a kitchen torch, and the desire to toast homemade marshmallows catapulted this project to the top of the list. I knew there was a vegetarian version of marshmallows made with xanthan gum in Demolition Desserts , but I had read that they don’t set up as firm as marshmallows made with gelatin. I decided to try them anyway. 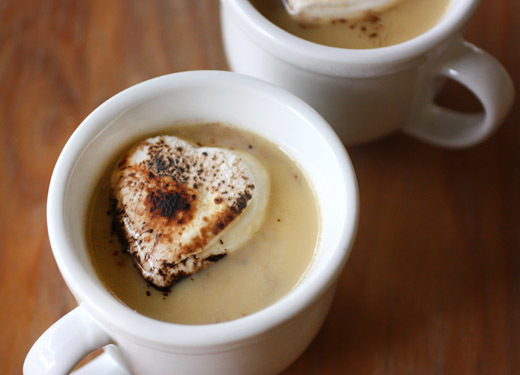 Once I had gelatin-free marshmallows and the ability to toast them, it seemed natural to then float them on top of some rich and delicious hot chocolate. I took a few cues from Ina for the technique and whipped up a white hot chocolate with a little espresso to balance the sweetness and some Kahlua to reinforce the coffee flavor with an alcoholic edge. A sprinkle of cocoa powder before floating the marshmallow added a bit of dark chocolate flavor too. So, to make vegetarian marshmallows, the process is the same as for making ones with gelatin only instead of dissolving gelatin in a hot sugar syrup, xanthan gum is added after the hot syrup is incorporated into the egg whites. Water, cream of tartar, sugar, corn syrup, and half a vanilla bean were placed in saucepan over high heat and brought to a boil. The heat was reduced to medium, and a candy thermometer was attached to the pan. The syrup was cooked until it reached 248 degrees F, and meanwhile, three egg whites were being mixed in a stand mixer with the whip attachment. The hot syrup was added to the egg whites while mixing, and as soon as all the syrup was added, one and a half teaspoons of xanthan gum was added. You get the same, glossy, sticky meringue. That is then transferred to a cornstarch-sprinkled pan and left to set. I cut some marshmallows into heart shapes, and they did seem softer and a little gooey-er than marshmallows I had made with gelatin in the past. They held their shape well enough for floating on hot chocolate though. For the hot chocolate, I chopped four ounces of white chocolate and heated two cups of milk to a simmer. I poured the hot milk over the white chocolate and whisked until it melted. I poured that mixture through a sieve, just like Ina, into a small, heat-proof pitcher. Then, I added one tablespoon instant espresso, a teaspoon of vanilla extract, and a splash of Kahlua. After pouring into two mugs, I topped each with a sprinkle of cocoa powder and a toasted marshmallow. I have to say I was very pleased with the slightly bitter edges of the toasted marshmallow in combination with the sweet, white chocolate. The resulting color of the hot chocolate itself with the added espresso and Kahlua isn’t exactly a beautiful shade of off-white, but the flavor made up for the unremarkable looks. 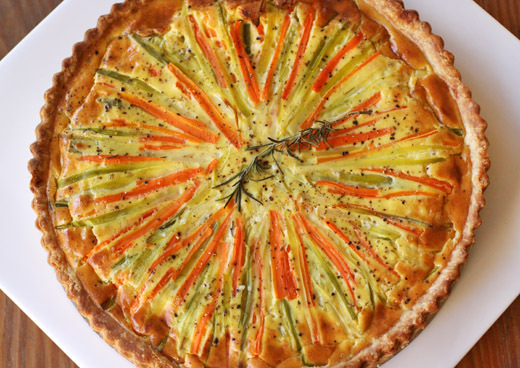 The sunny colors and starburst pattern make it hard to believe this is the winter version of this tart. It’s from Dorie Greenspan’s Around My French Table . She discovered this tart at her friends’ bed-and-breakfast outside Dijon which is fitting because the tart is flavored with that region’s mustard. There’s Dijon as well as grainy mustard, or moutard a l’ancienne, in the custard, and they bring a brightness that’s unexpected but lovely. The original version of the tart was topped with either slices of big tomatoes or halved cherry tomatoes. I’ll have to wait a few months to try it that way, but I can imagine how good that will be too. 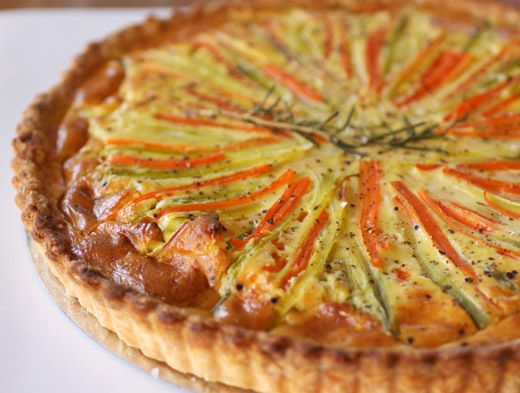 When tomatoes aren’t in season, the tart can be topped as it is here with julienned pieces of carrots and leeks. I served this for Sunday brunch, but it would also be great for lunch or dinner with a little salad on the side. The recipe in the book is written for a nine to nine and a half inch tart, but my round tart pan is eleven inches. I need more tart pans. To work with what I have, I did some quick math to scale up the ingredient quantities. To fit an eleven inch pan instead of a nine inch pan, all quantities need to be multiplied by one and a half. First, the tart shell was blind-baked and cooled. Meanwhile, the carrots and leeks were prepped. They were cut into skinny sticks and then steamed for a few minutes. Depending on how skinny you cut your vegetables, you’ll need to adjust the steaming time. Mine were pretty slim and became tender in the steamer in no time. A rosemary sprig was added while they steamed. Then, the vegetables were drained and patted dry. The custard was made with eggs, cream, Dijon mustard, grainy mustard, and salt and pepper. Dorie cautions you to taste before adding much salt since the mustards bring salt as well. And, you should taste for the mustard to be sure the flavor is strong enough and add more as needed. 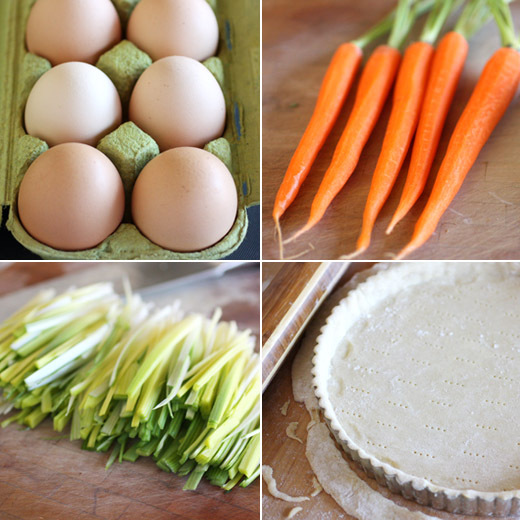 The custard was poured into the tart shell, and the carrots and leeks were arranged on top. A fresh sprig of rosemary was set on top before the tart went into the oven for about 30 minutes. The custard takes some of the edge off the sharpness of the mustards, but their savoriness is unmistakable. It really worked to wake up the other flavors. And, those thin pieces of carrot and leek were tender enough after steaming to easily cut through them with a fork for each bite. It was perfect in its simplicity, and I’m glad there are two versions so I can make this year-round. I frequently say things like “homemade is always better,” and I will attempt to make just about anything from scratch at least once. So, I was curious about what made the “make it” rather than “buy it” list in Make the Bread, Buy the Butter by Jennifer Reese. I received a review copy of the book, and it’s an entertaining read. It’s not so much a piece on precise calculations of whether it’s less expensive to make things from scratch or buy them; although, there are cost comparisons for each recipe in the book. Instead, it’s an honest and humorous account of what the author did make, whether the process was enjoyable or not, and if she thought the result was worth the trouble. Reese’s experiences included raising chickens, ducks, turkeys, and goats, curing bacon, salmon, and prosciutto, baking hamburger and hot dog buns, and making homemade yogurt and cheeses among many other things. Speaking of those buns, she recommends making hot dog buns because the store-bought variety is so flavorless, and the homemade ones are better-tasting and less expensive. However, with hamburger buns, she found the homemade options she tried to be too firm and not fluffy enough and recommends buying them. I had to disagree with this conclusion because I’m very fond of homemade hamburger buns, but forming your own opinion is part of the fun of this book. The author shares her experiences and her reasons for choosing to make or buy each item. It gets you thinking about your own priorities with things like time versus money and control over ingredients versus convenience. The cheese chapter was especially interesting to me. I’ve been toying with the idea of attempting cheese making for a while, but so far, I’ve only made ricotta. Mascarpone seemed like a good next step. It’s an easy process, and the cost, even starting with organic cream, is considerably lower than store-bought mascarpone. You heat a quart of cream in a double boiler, and you want the top bowl of the double boiler to be well inside the pan of simmering water. The temperature needs to come up to 196 degrees F, and that will take forever if your bowl is too far from the simmering water. Once it comes to temperature, you add a scant quarter teaspoon of tartaric acid. Now, it’s important that you use exactly tartaric acid and not cream of tartar. Cream of tartar is derived from tartaric acid, but chemically, they are not the same. I found tartaric acid locally at Austin Homebrew Supply, and it’s also available online. After adding the tartaric acid, remove the bowl of cream from the heat, and stir and stir until the cream thickens. Let it sit to come to room temperature, and then line a sieve with fine-weave cheesecloth and place it over a bowl. Pour the thickened cream into the lined sieve, cover with plastic wrap, and refrigerate for at least twelve hours. Reese notes that sometimes the process just doesn’t work, and the cream doesn’t thicken. You can try adding a tiny pinch more tartaric acid and stirring more, but occasionally it doesn’t become cheese. Thankfully, I had no problems, and like magic, the next day I had a pound of mascarpone which cost about $5.00 for the organic cream plus a few cents for the tartaric acid and natural gas for operating the stove. 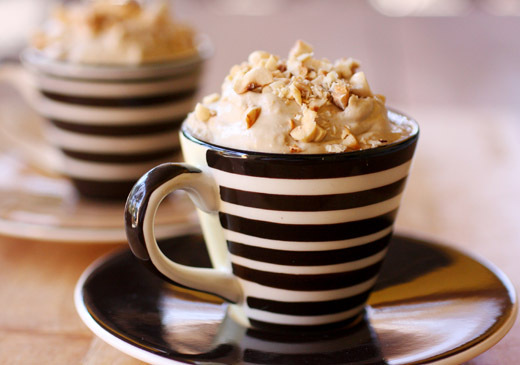 Following the recipe for the mascarpone, there’s a semifreddo made with it and flavored with espresso. It’s the kind of dessert that you have to make in advance which would make it perfect for a dinner party. It needs to be chilled in the freezer and then softened in the refrigerator before serving. 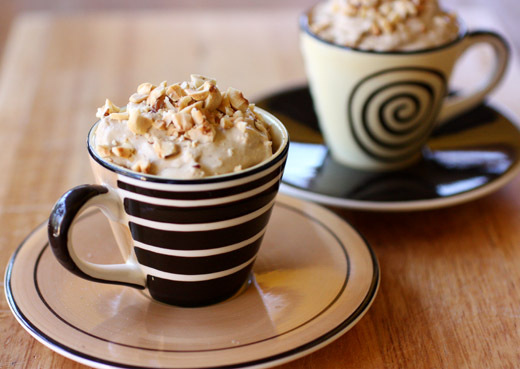 An espresso-flavored custard was made first, and that was left to chill in the refrigerator. Next, a meringue was whipped in one bowl, and the homemade mascarpone and some cream were combined in a second bowl. 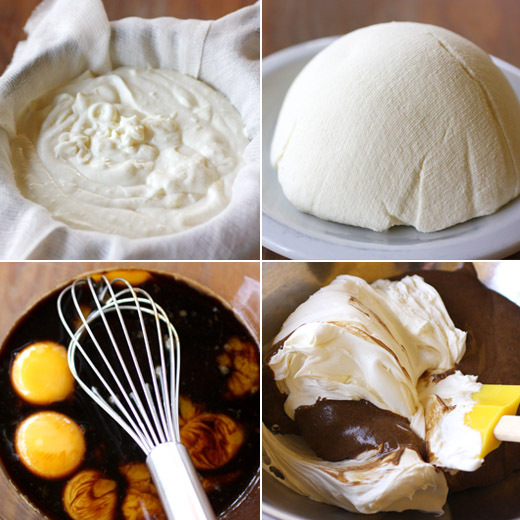 The mascarpone and cream mixture was folded into the espresso custard followed by the meringue. I spooned the semifreddo into serving cups before freezing them, and that way, the softening time in the refrigerator was quicker than it would have been with one big bowl. 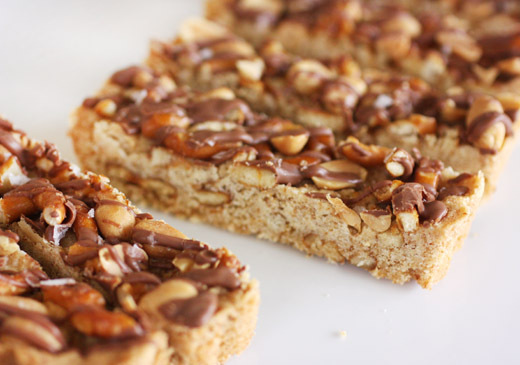 Each serving was garnished with chopped hazelnuts and then quickly disappeared. I’ll definitely be making my own mascarpone from now on, when I have the time to make it. And, I’m going to try making some other cheeses too as well as homemade ginger ale, vermouth, nutella, berry vinegar, and pot stickers to name a few things. I've been thinking about this dish for a long time. I made it for the first time ages ago, but I failed to take any photos. I don't remember why, but I must have been rushed. 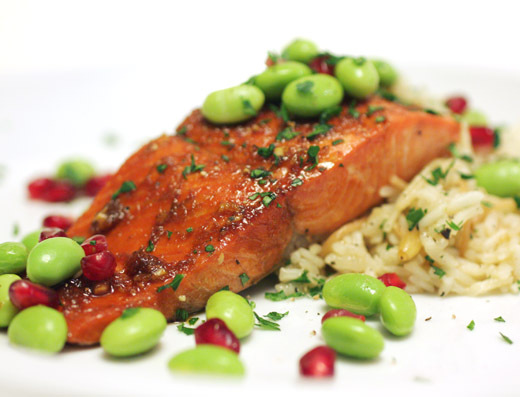 Since then, I kept remembering the citrus and ginger in the salmon marinade, the tart pomegranate molasses in the glaze, the buttery rice, and the pretty edamame and pomegranate seed garnish. It was time to make this again and this time with a camera in hand. 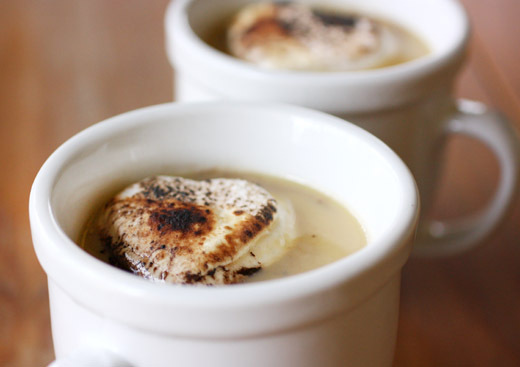 The recipe is from the December 2009 issue of Food and Wine, and it's available online. Now, fresh, wild salmon and pomegranates are not in season at the same time, but this dish works well with previously frozen salmon. 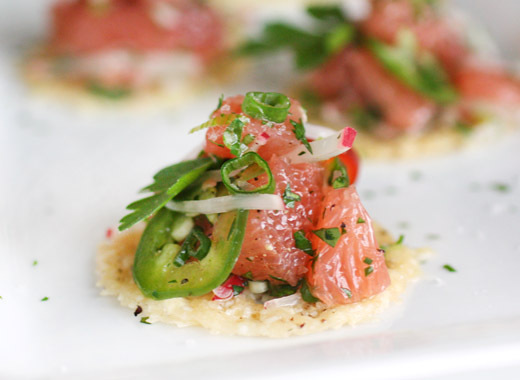 Whole Foods must have read my mind because just when I pulling out this recipe again, there was a special on wild salmon that had been frozen at the peak of the last season. The thawed and portioned salmon fillet does need to be marinated for about an hour, but then finishing the dish goes quickly. For the marinade, soy sauce, olive oil, lemon juice, lime juice, agave nectar, smashed garlic cloves, grated ginger, and salt and pepper were combined. The salmon pieces were placed in a shallow dish, covered with the marinade, and refrigerated for an hour. While the salmon marinates, you can make the glaze which is a mix of pomegranate molasses, agave nectar, soy sauce, minced garlic, grated ginger, and lime zest. Next, you should start the Armenian rice. The rice recipe makes a huge quantity, and I cut it in half. To start, butter was melted in a large saucepan, and then vermicelli broken into small pieces was added with pine nuts. That was cooked until everything was golden brown, and long-grain rice was added. Chicken stock was added and brought to a boil before reducing the heat to low, covering the pan, and cooking for 25 minutes. When cooked, the rice was fluffed and chopped mint was added. The salmon was placed on a baking sheet, brushed with half of the glaze, and cooked under the broiler for a few minutes. The rest of the glaze was brushed on the salmon, and it finished cooking for a few more minutes. 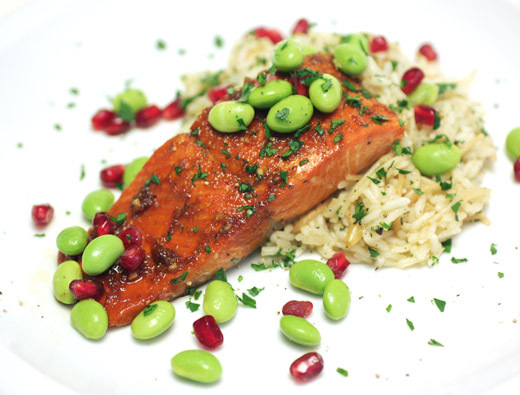 To serve, the salmon was set on the rice, and the plate was garnished with edamame and pomegranate seeds. 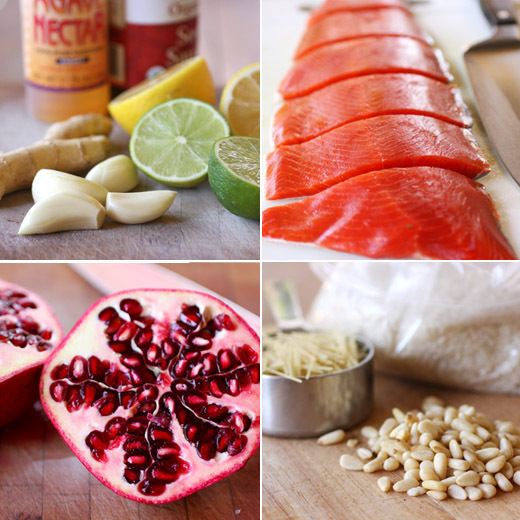 The big, fresh, tart, and savory flavors carried by the salmon were highlighted by the pop of the pomegranate seeds, and the mild, nutty, herby rice was a great contrast. It's not all that often that I circle back and make the same thing twice, and I was thrilled to find this dish was definitely as good as I remembered.